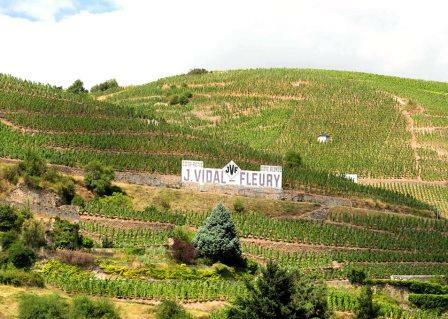 What we know of as Vidal Fleury has one of the longest histories in the Rhone Valley. The formation of Vidal Fleury, by the Vidal family dates all the way back to 1781 making Vidal Fleury, the oldest wine, continuously producing estate in the entire Rhone Valley that has continued to remain active as a wine producer. Thomas Jefferson, the third president of the United States visited the domaine in 1787, when Thomas Jefferson was touring the vineyards of France. During the same trip, Thomas Jefferson also toured the vineyards of Hermitage and Bordeaux and of course, Vidal Fleury. The company officially became known as Vidal Fleury in the 1890’s when Gustave Vidal married the daughter of the Fleury family. The company, based in the Northern Rhone did not expand until the 1920’s into the Southern Rhone Valley. Vidal Fleury is where Etienne Guigal got his start in the wine business, before he went on to form his own eponymous company. Several decades later, in 1984, a few years after the last surviving member of the Vidal Fleury family passed away, the company Vidal Fleury was purchased by Etienne Guigal and his now famous and rapidly growing Ets Guigal company. 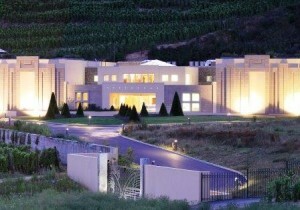 In 2006 Vidal Fleury underwent extensive renovations and modernizations, becoming one of the true, state of the art wineries in the entire Northern Rhone Valley. All of their vineyards are managed using only 100% self sustaining vineyard management techniques. The best vintages of Vidal Fleury Cote Rotie are: 2018, 2017, 2016, 2015, 2012, 2010, 2009, 2003, 2001, 1999, 1998, 1997, 1995 and 1991. Vidal Fleurie produces 3 Cote Rotie wines. Vidal Fleury La Chatillonne is the top wine from Vidal Fleury vineyard on the Cote Blonde. La Chatillonne is produced from close to 1 hectare of vines on the Cote Blonde in the Chatillonne lieu-dit. The Syrah vines for La Chatillone are almost 60 years of age. The blend includes up to 12% Viognier. La Chatillonne is aged on its lees in new, and used French oak barrels for up to 48 months before bottling. Not much of this wine is made as the production is under 300 cases of Vidal Fleury La Chatillonne per vintage. Vidal Fleury Cote Rotie Brune et Blonde. As you might guess, the Brune et Blonde is produced from fruit harvested from both the Cote Blonde and Cote Brune hillsides. The blend is most often 95% Syrah with 5% Viognier. The wine is aged on its lees for up to 48 months in old, used oak foudres. Vidal Fleury Brune et Blonde is fairly to find, and a lot less expensive to purchase than their top cuvee, as close to 1,000 cases of this wine are made each year. Vidal Fleury Cote Rotie is their standard Cote Rotie, which is considered their entry level wine. Vidal Fleury, when young, should be decanted at least 1-2 hours, give or take, allowing the wines to soften and open their perfume. Older vintages might need very little decanting, just enough to remove the sediment. Vidal Fleury is often better with 8-10 years of cellaring and should be at its best between 10-20 years of age. Vidal Fleury is best served at 15.5 degrees Celsius, 60 degrees Fahrenheit. The cool, almost cellar temperature gives the wine more freshness and lift. Vidal Fleury is best served with all types of classic meat dishes, veal, pork, beef, lamb, duck, game, roast chicken, roasted, braised and grilled dishes, tomatoes, eggplant and sausage. Vidal Fleury is also good with Asian dishes, hearty fish courses like tuna, mushrooms and pasta. Vidal Fleury is best served at 15.5 degrees Celsius, 60 degrees Fahrenheit. The cool, almost cellar temperature gives the wine more freshness and lift. Young vintages can be decanted for 1-3 hours, depending on the character of the vintage. This allows the wine to soften and open its perfume. Older vintages might need very little decanting, just enough to remove the sediment. Vidal Fleury is best served with all types of classic meat dishes, veal, pork, beef, lamb, duck, game, roast chicken, roasted, braised and grilled dishes. Vidal Fleury is also good with Asian dishes, hearty fish courses like tuna, mushrooms and pasta. Condrieu, the white wine of Vidal Fleury is best served with a myriad of different seafood dishes, shellfish, crab, lobster, sushi, sashimi, chicken, pork and veal, as well as Asian cuisine. While I do not get to taste these wines often enough, the wines being made today at Vidal Fleury are the best they have produced in years, if not ever in the history of the estate. Their top Cote Rotie wine, La Chatillonne sells for a fair price for a wine that is at its level of quality. Aside from Cote Rotie, Vidal Fleury also produces red and white wine from Chateauneuf du Pape, Crozes Hermitage, Hermitage, Cornas, St. Joseph, Condrieu, Vacqueyras, Gigondas, Cotes du Rhone, Cotes du Ventoux, Cairanne, Tavel and Muscat-de-Beaumes-de-Venise. The deep, purple color looks great in your glass. And that's just the intro as the nose offers spice box, incense, flowers, smoke and red fruits. The sensual texture has no hard edges, instead it's all about the silky tannins, freshness to the fruits and the peppery edge in the finish. Fresh exotic cherries, peppery spice, smoke and herbs pop almost before being asked. It only gets better on the palate as the wine is silky, fresh, forward and inviting. With loads of peppery zest, this is already showing really well, and it is only going to get better from here. I am not sure I have ever seen a Chateauneuf du Pape from Vidal Fleury before. Spicy in character, with incense, sweet red fruits and smoke catches your attention. Medium bodied. fresh and forward, with a nice style, there is sweetness to the red fruits here. This will drink well on release. Light in color and fruit, this is also easy to like, due to its sweet, peppery kirsch charm and soft textures. This is a nice, enjoyable, quaffer, that does not pretend to be anything else. Luscious, supple-textured, aromatic and filled with sweet, fresh, ripe, juicy, dark cherries, flowers, smoke, olives and thyme, this is already starting to drink quite well. With a beautiful floral nose, made even better with its smoke, earth, wild cherry, blackberry, stone, spice and espresso nose. Silky, polished, lively and fresh, medium/full bodied, with sweetness and purity to the dark red and black fruits that is good now, and will be better with age. For a Cote Rotie of this quality, the wine is priced quite fair, as Cote Rotie is an ever increasingly expensive appellation. Young, full bodied, bright, vibrant, crisp red berries, flowers, smoke and licorice are found on the front end. Sweet, lush, concentrated and fresh, with opulent textures, the pure, spicy cherry liqueur in the finish really stands out. Medium bodied, fully developed, the wine offers wet earth, pepper, underbrush and bright, red berries. Soft, open and fresh, if you have a bottle, I'd pop a cork over the next couple of years. This charming, crowd pleasing wine is made from a blend of 65% Grenache and other Rhone varietals. Soft, round, sweet, medium bodied, with spicy kirsch in the finish. I'd drink this over the next year or two. Fully mature, and then some, yet, even though the wine was clearly hanging on to life by a thread, there was still enough, earthy, spicy, fresh, bright red fruits and herbal notes to be interesting, especially considering its age.